This is a homage to an old local building tradition preserved for the future. A several hundred-year-old timber logs building floating on a modern glass construction. Flydalsjuvet is a canyon at the end of the Geiranger Fjord. 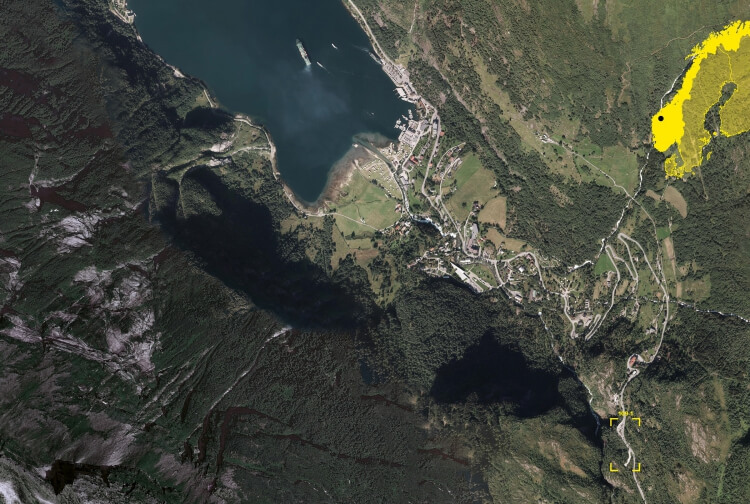 The resting area is located on one of the steep mountain sides leading to the fjord, across the valley from Ørnesvingen. The main task at Flydalsjuvet was to secure a safe access for the numbers of visitors from the upper plateau where disembarking from buses and parking is located, down through a ramp to the viewing point at the lower level. On the lower level there are three individual buildings placed on a terraced concrete floor with narrow path-ways between them leading to the partly secured ridge of the mountain. Several hundred-year-old timbered building modules were reused as framework for a new structure to facilitate toilets and information stands. The logs were collected from a local site and refurbished by tradition-carrying craftsmen. The walls were then mounted on a structural glass base, allowing light to enter under the massive wooden walls.